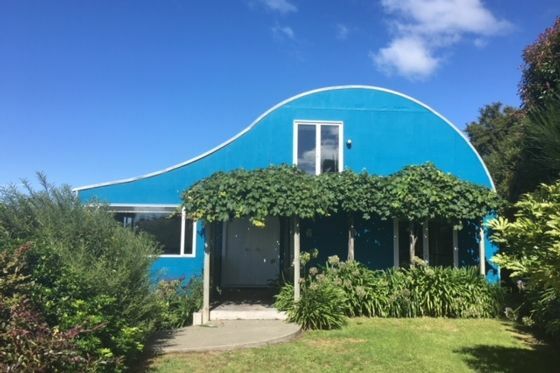 A modern spacious home set in a scenic reserve. Four minute walk to town and lake front. Views of the river. Upstairs mezzanine is a master bedroom with ensuite (and bath). Downstairs two fully enclosed bedrooms are off a large open area and separate shower/toilet room. In the open area there are 2 single beds and room for a further rollaway, if required. There is parking for 2 cars in double garage under the house and on the lawn for boats or trailers etc. Although close to town, the house is situated at the end of a no-through road and is quiet and tucked away. Views of the river can be seen from the lounge and upstairs bedroom, as well as from outside on the balcony. This location provides easy access to the river for swimming, kayaking and fishing as well as a central location to town. This well appointed modern home has all the amenities for a relaxing holiday with family or friends. PLEASE NOTE THE HOUSE IS IN A QUIET RESIDENTIAL AREA AND LOUD PARTIES OR GATHERINGS WOULD NOT BE TOLERATED. A good venue for 2 families or a sporting group. Peak rates apply for Special Events and Public Holidays. Linen is left on the ends of the beds and to be stripped at the end of your stay please. NOISY GATHERINGS OR PARTIES WILL NOT BE TOLERATED AS THE PROPERTY IS IN A QUIET RESIDENTIAL AREA. Leave the car behind and walk to town. The 5 min walk to town is very convenient. Important: the pathway to get to town is accessed through the driveway of the house below this one. The only way we knew this was because we saw people use it. Thankyou for your positive response. The layout is perfect for families and a great location to town and the river. We will update the website for finding the walkway (our apologies). No WiFi (when on holiday! sorry), good mobile reception. We would love to have you stay again and thanks for leaving the property in great shape, following the house rules. A great place to stay. Was clean and tidy and full of character. The frosted glass door on the shower and toilet room was a little unnerving at first when sharing with another family but got used to it. Good house for a family holiday - we had an extended family group and there was lots of space for everyone. Great location close to the river and short drive to town. The property was perfect for our group of 10.